Is your bathroom worn and tired? Our bathrooms in Romsey are styled to bring luxury and elegance back into your home. At BST Bathrooms, we take pride in taking your outdated bathroom and invigorating it with modern features and designs. With over 20 years experience, the team at BST Bathrooms know what styles are in vogue and which features will bring comfort to your bathing experience. When you recreate your bathroom with BST Bathroom, your Romsey bathrooms will transform into a luxurious, spa-like room in just two weeks. From your designs, we will customise each project to bring a personal touch into every work we carry out. Our Romsey bathroom service is all in-house, so from tiling to carpentry, we will carry out the complete renovation of your bathroom. Effective and stunning tiling is an essential feature in any bathroom. 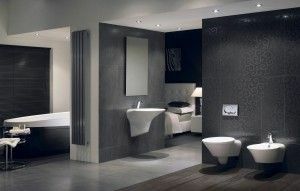 Its sleek surfacing and versatility have provided many bathrooms in Romsey with inviting designs. Taking in your budgets and specifications, BST Bathrooms will find bespoke tiling to suit your requirements. Our tiling comes in varying colours and patterns, sizes and shapes, to give you the ultimate choice on your bathroom tiling. From rewires, lighting design and bathroom fans, our electricians are knowledgeable in their sector and will implement their electrical expertise on your bathroom project. With our creative lighting, we will highlight the gorgeous features within your bathroom. All of our electricians are fully qualified to undertake electrical services of a large or small scale. Are you remodelling your bathroom? With the right bathroom units you will enhance the luxury of your bathroom with our Romsey bathroom service. Our carpentry will complement your newly decorated bathroom with inviting accessories. We customise our carpentry to your individual bathroom designs to deliver a superb finish to one of the most important rooms in your home. When you are choosing a professional and comprehensive company to redecorate your bathroom, then BST Bathrooms will exceed all of your expectations with their stunning Romsey bathroom designs. Take a look at our gallery and find the bespoke bathrooms we have created. Give BST Bathrooms a call on 023 8045 3112 and find out how we can transform your bathroom in Romsey with invigorating, modern designs. If you have any queries, don’t hesitate to send an email to info@bst-bathrooms.co.uk.